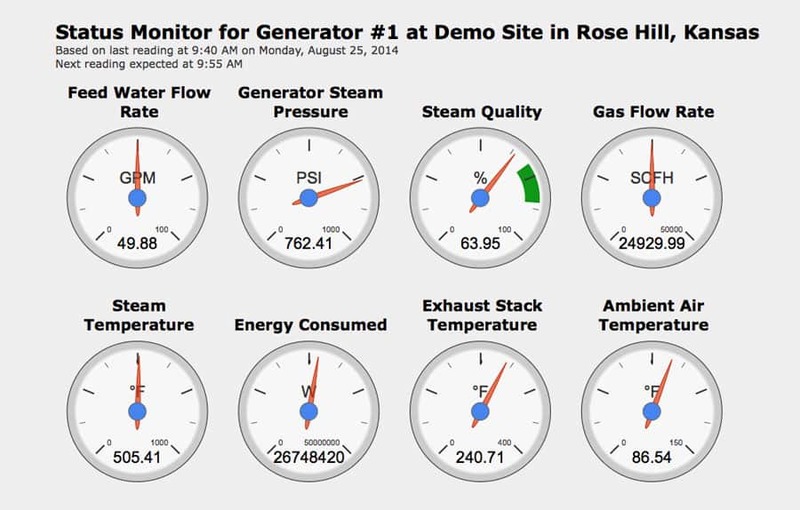 Monitor critical parameters from anywhere in the world. FlexMetrics Status Monitor is like a heads-up display showing Steam Pressure, Steam Quality, Gas Flow Rate and more. Quick, what’s your steam quality right now? Do you know what your feed water flow rate is at this moment? Have there been dips in your fuel flow rate over the past month? If you can’t answer these questions because you’re on the road, standing in line or tanning by the pool, consider FlexMetrics, ACES’ latest innovation for steam generator control systems. With a simple landline modem, cell modem or internet connection installed in your FlexSteam control panel you can transform your laptop, smartphone or tablet into a remote dashboard for your steam generator anywhere you access the Internet. 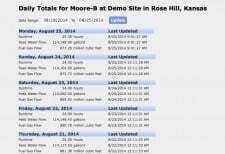 FlexMetrics History Data charts eight important parameters in detail over the preceding eight hours. Remotely monitor current steam quality, feed water flow rate, steam temperature, fuel flow rate and steam pressure, updated in 15-minute intervals. Load customized historical charts of those same parameters. Set your own range for steam quality and easily see if it drops below. 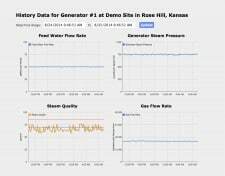 Keep an eyeball on daily totals for runtime, feed water flow and fuel gas flow, per day or over the life of the entire generator. 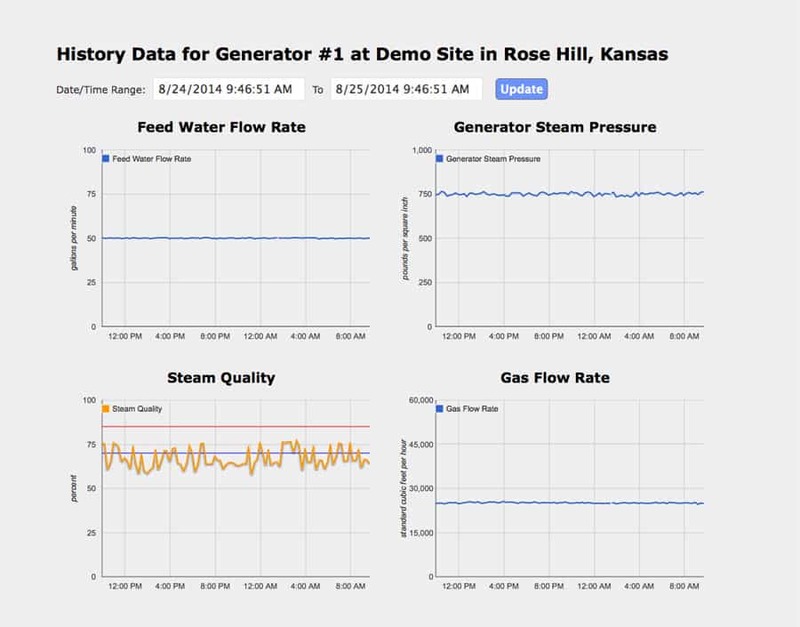 We could go on and on about the convenience and efficiency of having these figures at your fingertips almost anytime, anywhere — but see for yourself: Check out FlexSteam.com to experience a live demo monitoring a pair of working generators in real time. 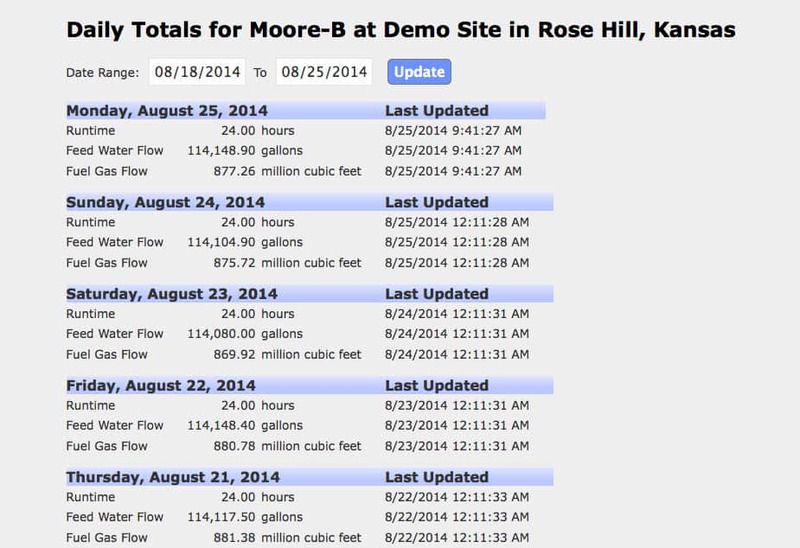 Track daily totals for Runtime, Feed Water Flow and Fuel Gas Flow. At this time FlexMetrics is only compatible with FlexSteam steam generator control panels installed by ACES. To learn more about the plug-and-play FlexSteam control panel system, or to order FlexMetrics for your existing FlexSteam panel, give us a call.